Ephraim Ray Weaver, Commander, born Nov. 19, 1903, Cass County, MO; attended elementary school in Cass County, MO; Kansas City Business College; and enlisted in the USN Oct. 2, 1928. During his tours of duty in the Philippines and China, his wife, Thelma, traveled there and taught the children of the servicemen. She was intending to join him in Hawaii when the attack came on Pearl Harbor. He was aboard the USS West Virginia on Dec. 7, 1941, having taken the duty for a friend. After the West Virginia was repaired and seaworthy, she came back to San Francisco. Cmdr. Weaver was then ordered to Bellingham, WA, where he was given command of ATA-180 and served in the Pacific until the end of the war, August 1945. 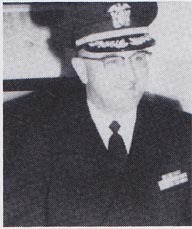 He retired as commanding officer of the USN Recruiting Station in Kansas City, MO, on Feb. 1, 1957. The Weavers moved to Liberty, MO, in July 1962. They had no children. After he retired from the service, he enjoyed overseeing his Thelma's parents' farms. He was in a nursing home in Liberty for seven and one-half years and could not speak. He passed away on Oct. 20, 1990. Submitted by Thelma Weaver.